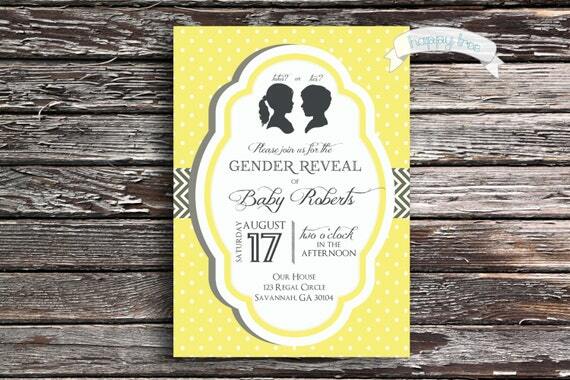 Gender reveal parties are definitely a thing of this generation and I believe they are here to STAY. 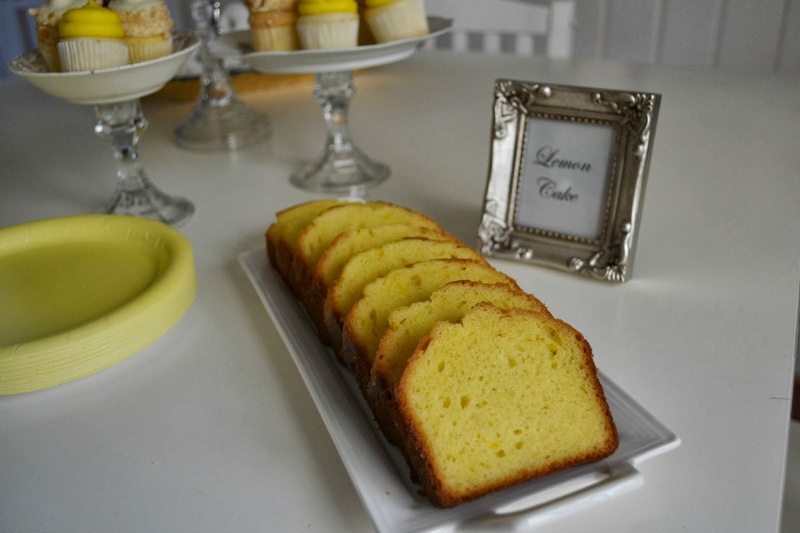 Then again, I'm always looking for the next fabulous excuse to host a party. We decided to host a gender reveal because the idea of finding out such exciting news in a party environment, surrounded by our loved ones, was much more appealing than being in a sterile and quiet doctor's room. Plus, ultrasounds can be nervewracking! For us, we are so happy to see our babe on the big screen, but tensions can run high during those appointments as you are scouring the sonogram looking for every hopeful sign that your baby is healthy and growing. The next big question is - will you be in on the surprise, or will you find out yourselves at the party? 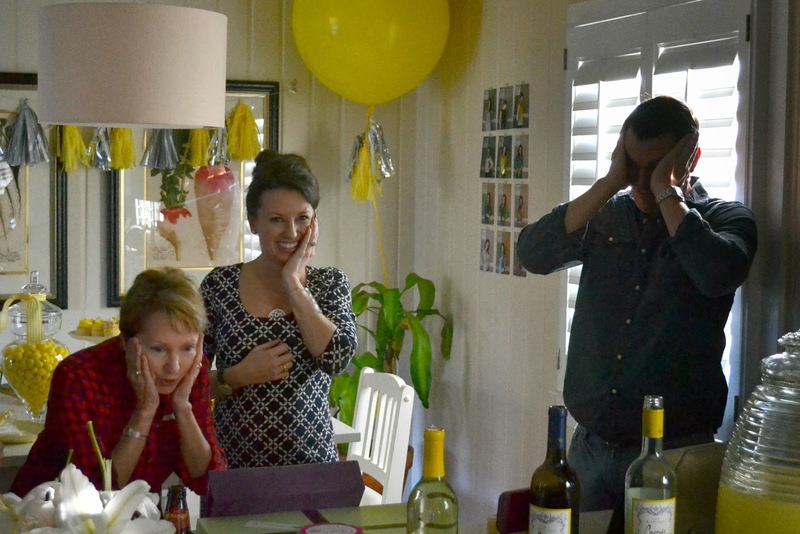 Due to the reasons above, we also decided to hold out and be surprised at our own gender reveal. It's hard waiting but I would totally recommend this. 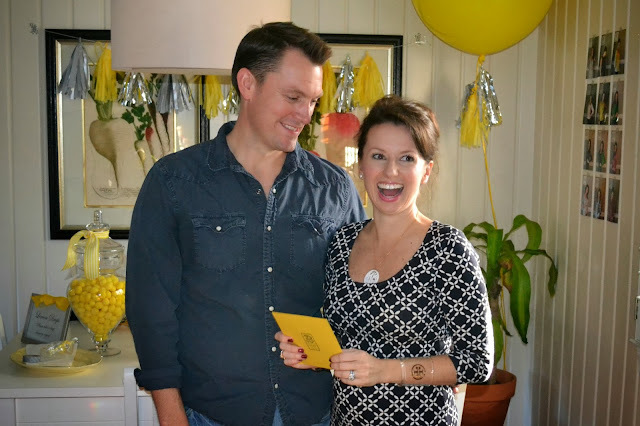 I was convinced that we were having a boy, and selfishly, while searching for the invitation I thought this might be my last opportunity to go with a color and style that was a little more feminine than I'd dare to go after hearing the news. When I found this Happy Tree invitation on Etsy, I felt like it was made for me. Yellow (my very favorite color), sweet silhouettes, the mention of tutus or ties (I used to take ballet and Ian is more of a tie guy than a bowtie guy), the font, the polka dots, everything. It was just so me. The shop owner was easy to work with! I purchased the PDF from her for $15 and then took it on a flash drive to Kinko's for printing. They were able to fit two 5x7 invitations per page which was a cost-savings, and I used the paper cutter there to cut them out myself to save even more money. They were printed on 110# white cardstock. I purchased charcoal gray envelopes from Paper Source and a white pen to address the envelopes in a fun script. 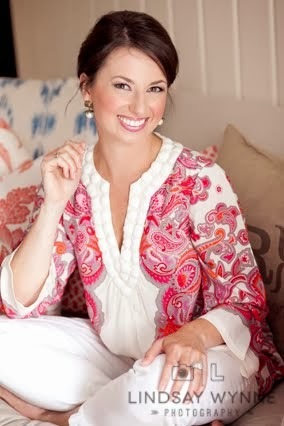 After securing the invitations, I started a private Pinterest board to gather inspiration and ideas, and it's now public here if you want to take a peek. 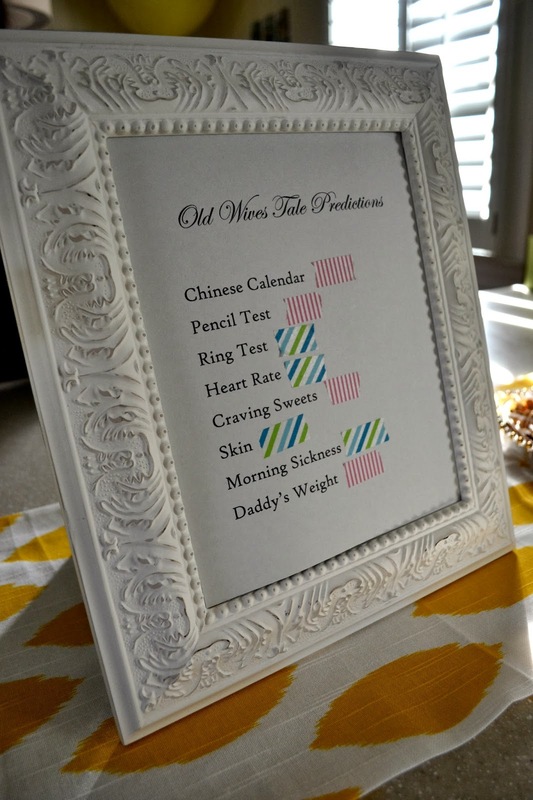 I created an old wives tale predictions chart in Word, printed it at home on light gray cardstock, and used blue and pink washi tape to show how my response to each question would tally up. I was four and four ... tied! 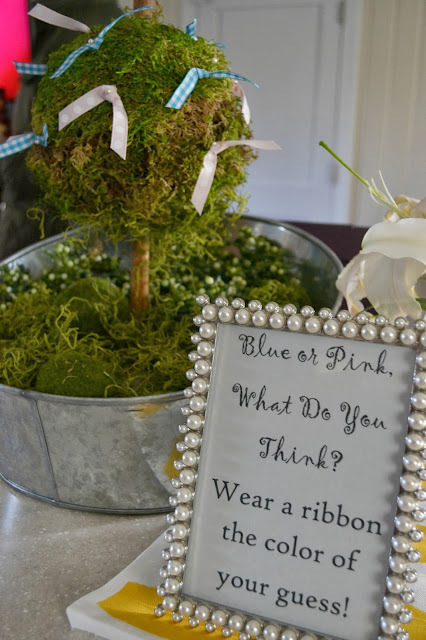 This topiary tree I made for a girlfriend's baby shower became a ribbon tree for our guests to show their guesses. They picked a color from the tree and wore it on their shirt. The sign was another simple Word document printed on gray cardstock and displayed in a photo frame. I know all parties gather in the kitchen so I set up that area as the food and reveal site. I made the tassel garlands using tissue paper from Michaels (the silver and metallic) and Dollar Tree (yellow). I used this tutorial. The huge balloons were a sale find at JCPenney from their Martha Stewart entertaining line. They were on sale 2/$5 and I swear it literally cost me more to fill them with helium at Party City ($4/balloon) than the cost of the actual balloon. I printed my weekly belly photos at Walgreens when prints were 40% off and used gray striped washi tape to affix them to the wall. The party was at 3:00 so food was simple ... mini cupcakes from Gigi's (one dozen purchased through Groupon, the second dozen not), mini donuts, lemon cake, pretzel sticks and salted peanuts. 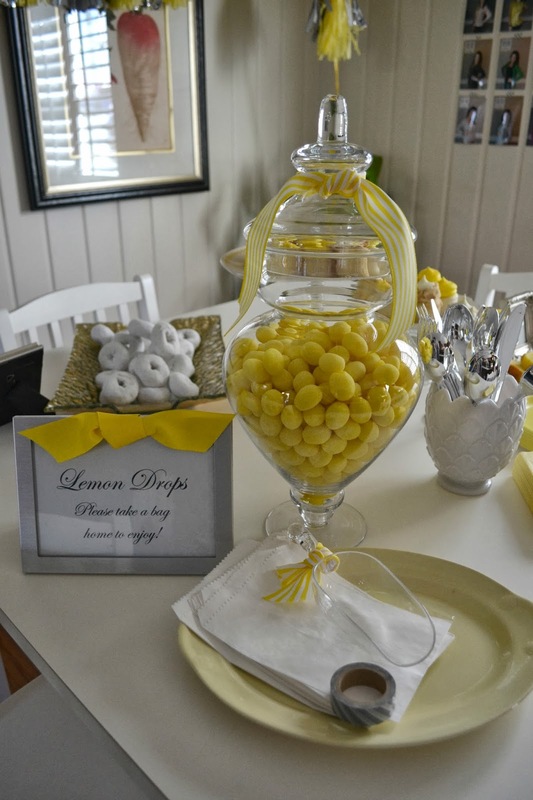 I also had a jar of lemon drops with glassine bags from Michaels for people to take home some candy. Disposables were key since this party was on a Sunday and I didn't want to spend a ton of time that night doing dishes. Plates, napkins, and metallic plasticware were all Dollar Tree finds. 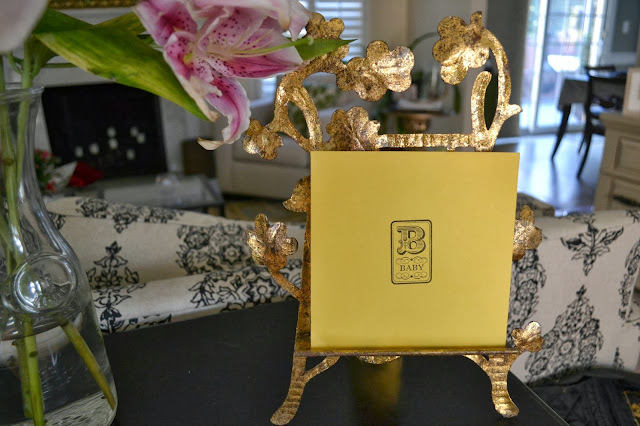 In our foyer, I framed the invitation and displayed what everyone was waiting for ... the golden envelope! You may have already seen the reveal video shared in this post, but the next few photos were taken on my camera by my good girlfriend Meg and I'm so thankful to her for capturing these moments! 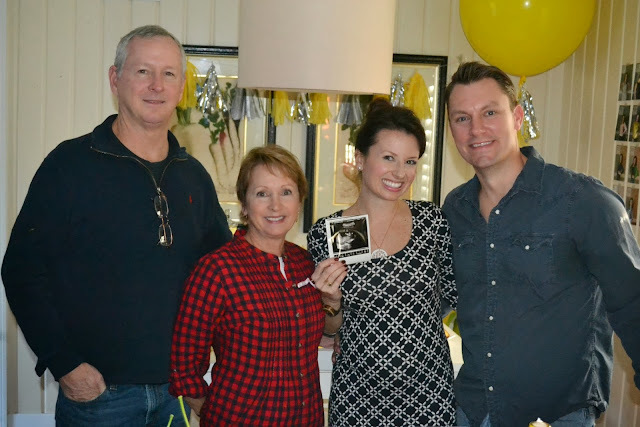 I explained that the gender was written in an envelope and that we wanted to do something a little out of the box and have my parents open the envelope. It was actually Ian's idea to have someone other than us to open the envelope. We knew Mom would be the perfect choice. What better way to hear your baby's gender from the own mother who carried you for nine months?! We also had a few aunts and my sister and her boyfriend Facetimed in for the reveal. And we were all SHOCKED! This next picture just means so much to me! It was incredible sharing this moment with some of my best friends and of course very special family members. And if you were curious ... Ian TOTALLY was hoping for a little daughter. He is over the moon. :) Needless to say, I feel the exact same way! I hope you all will link up for us tomorrow for Five On Friday, and remember -- it will go live at 8:30am Eastern time tomorrow and moving forward! What a lovely party!! I love that you have pictures of your reaction to treasure forever! 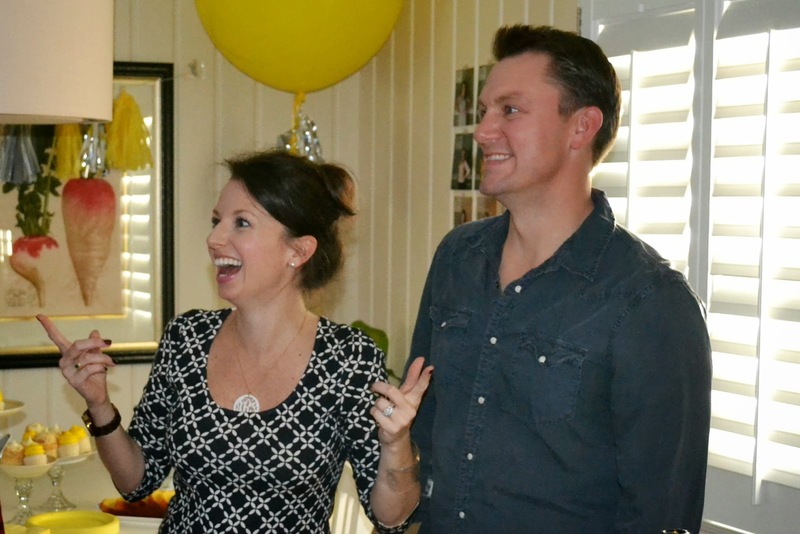 We didn't do a gender reveal party for my baby girl but you make me want to do one for baby #2 in the future! 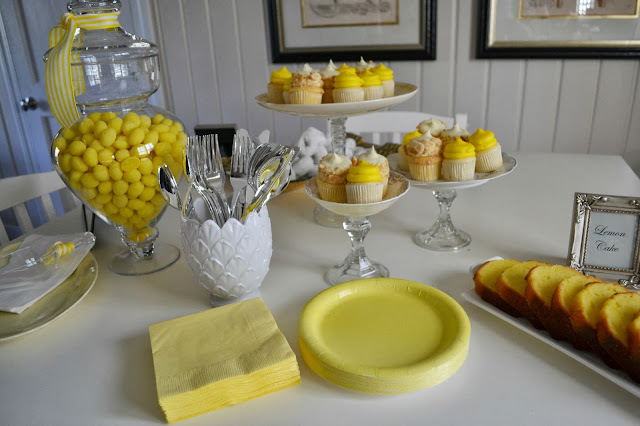 Love the yellow for the party, so perfect! And I am so excited y'all are having a girl!! So sweet! I love seeing everyone's reactions! What a treasure it is to ave those photos! What a PERFECT party!!!! I love ALL of the details! And Drake?! Oh my goodness he is such a party animal! I think it is so funny how you find the most AMAZING deals at Penneys!! I must take you with me there so you can show me the ropes. PS - did you know there is a helium shortage? Yep, learned that when I had to fill balloons for my last party. That's why it's so dang expensive to fill them! Your mom's face in the series of pictures is priceless! These pics got me teary! I love them. Yayee for a girl! 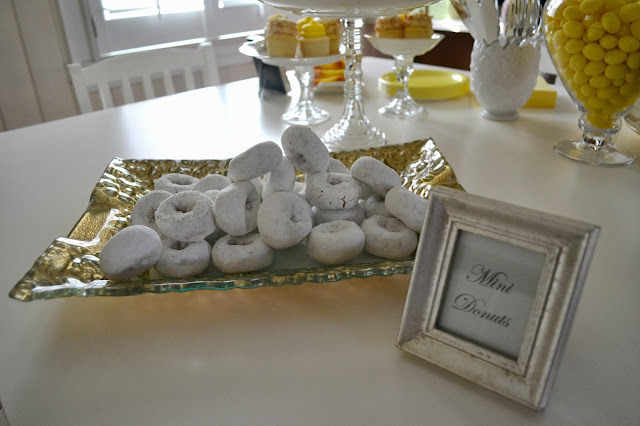 All of your party details were so cute!! I hope gender parties are here to stay. Congrats on having a sweet girl! Adore all the little details that went into your party! 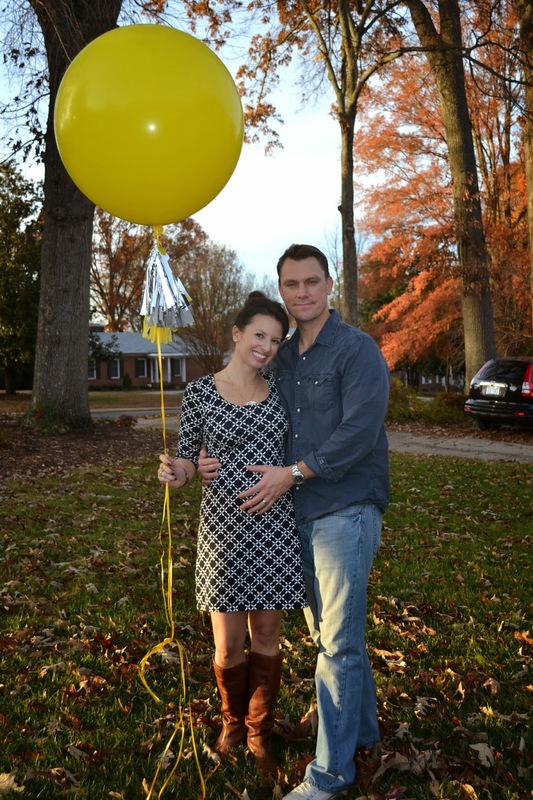 Gosh when I bought one of those large balloons for our engagement shoot in 2011 I paid $30!! Can you believe that?! Good to know JCPenny's carries them! Congratulations! It's such a exciting time and the party was adorable! Love the pictures, but loved the video even more. What a treasure to have forever. I have to admit, gender reveals get me every time. It's one of those sweet moments in life. It' only gets better from here! All the details are beautiful, love the yellow!! Such precious pictures, congratulations! I love how your mom immediately swapped out her blue ribbon for a pink one. Haha! The party looks so sweet and perfect with all the adorable touches, but the reactions of you and your husband plus family members...well that is just the most precious! Congrats again!! Yay! The party looked so cute. I am so excited for you. Love the idea of the topiary tree with the pink or blue ribbons. I've never seen that! 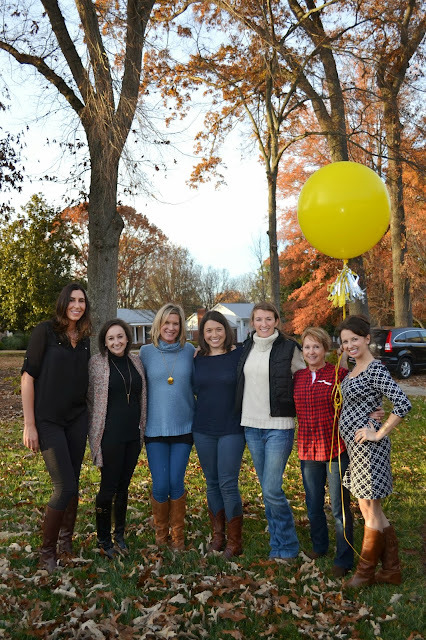 Such a fun party that looked perfectly planned and executed! Congrats on your baby girl. this is SO awesome! I LOVE the pictures of you guys finding out! Ah, so, so wonderful! Congratulations on your little girl. I love the way you did all of this. Love, love, love your party! So cute!! You will have way too much fun with a girl :) Congratulations! This is so darling. 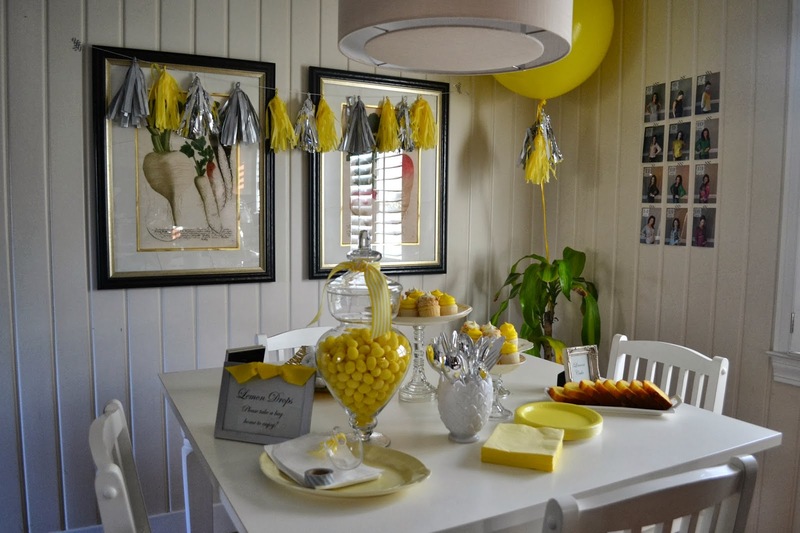 I love the yellow-themed food, and the garlands! What a fabulous way to celebrate your pregnancy and baby R! AH! I just love y'all! Those balloon pics are so cute. Oh my goodness! Love the pictures! Your decor and setup was adorable! So did you have a doctor or someone else make up the card with the gender in it? I've never heard of the parents being surprised too! I really like that! Congrats on the little girl! Your decor is so darling! I love that giant balloon and the tassel garland. The pics of y'all's reactions are so perfect! Congratulations to you and your family. Love all the details of the party!! Especially the little frames as placecards! I might have to steal that one!! Such an exciting time!! I know ours was! And the best thing about it? Our daughter's will one day get to see all of this and how happy we were to find out that they were girls!!! Congratulations on your baby girl!! Such a wonderful and exciting time. 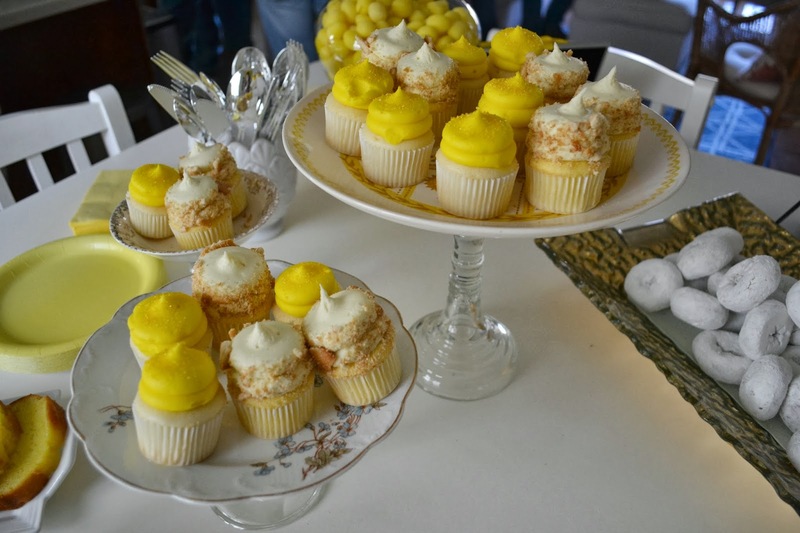 All of the details of the party were perfect. What a fabulous, special party!!! 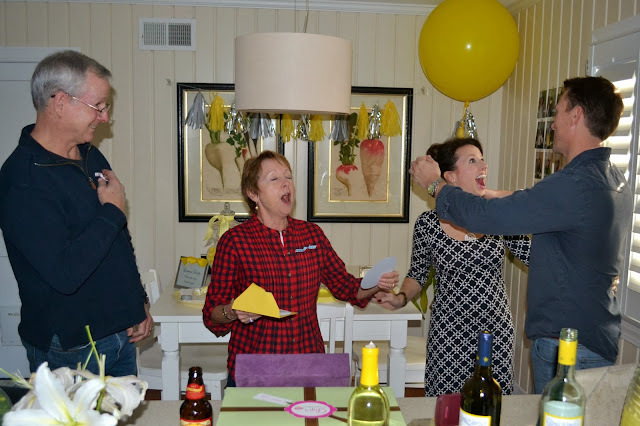 Love everything about it and especially yours and Ian's reaction when you found out you were having a baby girl (and your Mom's!)! Baby Girl will love, love, love looking back on this post some day. Makes me so happy! In this article there are methods which can be used to plan for a baby boy. Not every couples know how to plan baby boy but still they want a baby boy. There are some methods for that also which is done with almost 99.99% accuracy.